"Great Law is Message of Peace"
Young, David, Brantford Expositor, 1994 "Work on a tire-recycling plant at Six Nations stopped Thursday after protestors arrived at the construction site." "Confederacy Chiefs Assemble In Ohsweken"
Brantford Expositor, 11 Aug 1995 "Six Nations residents will welcome traditional Iroquois Confederacy chiefs from Canada and the U.S. for an assembly at the Onondaga Longhouse on Aug. 19." "Mohawk Women Fight Access Route"
"Mohawk women are warning city councillors not to proceed with a plan to extend the Brantford Southern Access Route through Six Nations land." "Story of Chief George Johnson Takes New Meaning in Six Nations Pageant"
White, Vicki, Brantford Expositor, Summer 1992 "A man who is probably best-known as the father of Mohawk poet E. Pauline Johnson will come to be recognized for much more than that after the run of the annual Six Nations Pageant." Article describing the presentation of a Maori greenstone to the Six Nations Council. The greenstone was presented to Chief E.P. Garlow by David Smith who had received the greenstone from Maori King Korokī. Portrait of Six Nations Confederacy Council, c. 1910, prior to the Federal Take-over of Council. Josiah Hill, Secretary of the Council is center. Photo taken at old Council House, Ohsweken Ontario. Image of Wampum belt given by Grand River Chiefs to John Brant, a version of the Guswhenta or Kaswhenta, Mohawk Covenant Belt. "Native Writers Recall Day Six Nations was Divided"
Young, David, Brantford Expositor, Fall 1994 "One of the most significant days in Six Nations' history was marked with speeches, a short walk and a small gathering on Friday." "Solution To Standoff May be"
Brantford Expositor, 25 Sep 1995 "Six Nations elected band council and occupiers of the Eagle's Nest Business Complex took a "major step" toward resolution over the weekend, said Chief Coun. Steve Williams." Photograph of John Smoke Johnson. 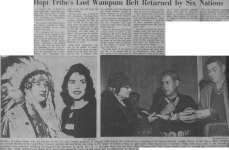 Article discussing Six Nations' return of a runner's belt to the Hopi Chief Banyackay in a ceremony at the Onondaga Longhouse.